Welcome to Wuxi URU Precision Industries Co., Ltd.
LV20/8 LV20/8ZZ locating Vee bearing track rollers with "V" profile. LV20/8 LV20/8ZZ LV20/8-2Z locating Vee bearing track rollers with "V" profile. • Series LV bearings can be widely used in the cylindrical track or " V " profile track with an angle of 120 degrees. Different from the series LFR bearings, series LV bearings are more adaptable to the different track sizes. Each type can be applied with a larger range of track diameters. They are widely used for the heavy-duty track, mobile equipment, wire straightening machine and so on. • Bearings take the internal structure design of double row angular contact ball bearings and have a thick-walled outer ring, so the bearings can accommodate higher loads. 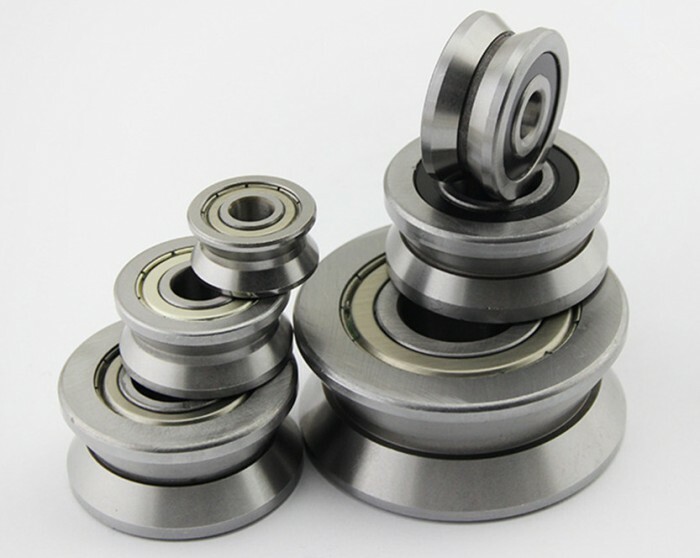 • Bearings are made of the high-quality bearing steel, processed by heat treatment and precision grind, and are filled with a long service life, high-grade and multi-purposes grease. Bearings take the metal shield to prevent the dust. URU also can provide the bearings with concentric or eccentric pivot. • The bearings have an undercut on its bottom of groove on the outer ring. If the application disallow this undercut, URU can meet customer's technical requirement. Also URU can accept the bearings with various angle of " V " profile. Wuxi URU Precision Industries Co., Ltd.